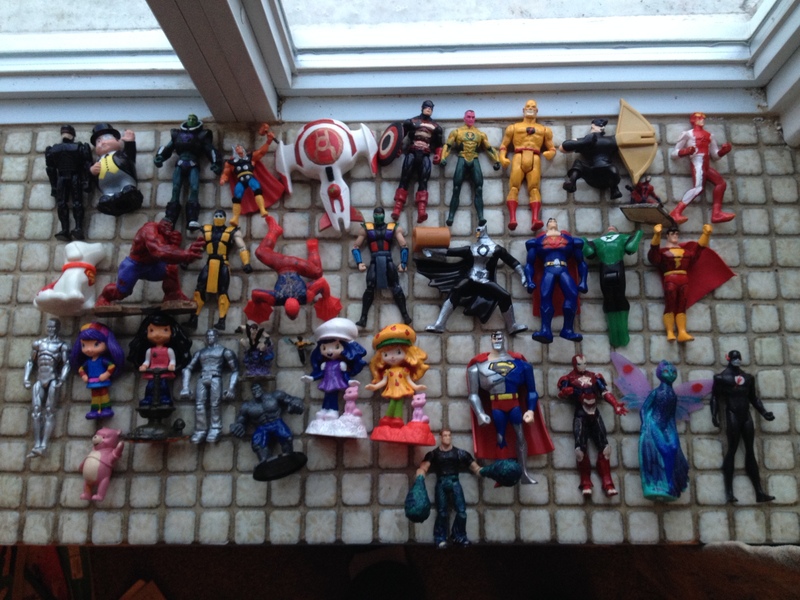 Last year I introduced my son to action figures, and the year before that, my daughter began collecting figurines to play with. When I was a kid, I recall wanting more characters than I had, but was always satisfied with what my parents had been able to afford. Then there was the occasional figure that came in a cereal box or a happy meal toy. Those figures were redundant to me, and I often used them as clones or dopplegangers. Now that my kids are in the same boat, I got to thinking. My mind went to work and I began using model paints to alter the appearances of them. After all, most comic characters have some similarity with others. Because it is model paint, it is best to use a flat paint, as glossy tends to chip off easier. Keep in mind that it might not be possible to get the costumes exact, but you can fake it, and they’ll love it. Anyway, here are the repaints I did for my kids (the original figures that I used are double characters, so they still have the original characters in their collections): Robocop 3.0 (a repaint of an old 1980s Robocop), The Penguin (a fisher price figure that had no use otherwise), Brainiac (repaint of Lexcorp guard), Beta Ray Bill (repaint of mini Thor figure), Red Lantern ship, (repaint of Aia Green Lantern ship), U.S. Agent (repaint of Captain America), Sinestro (repaint of green sinestro), Professor Zoom (repaint of The Flash), Merlyn The Dark Archer (repaint of Green Arrow), Impulse (repaint of Kid Flash), Antman (repaint of Spiderman from a gumball machine), Krypto (repaint of Fisher Price Dog), Red Hulk (repaint of Hulk), Scorpion (Repaint of Noob Saibot), Scarlet Spider (repaint of Spiderman), Chameleon (repaint of Noob Saibot), Owlman (repaint of Batman), Ultraman (repaint of Superman), Power Ring (repaint of Green Lantern), Shazam aka Captain Marvel (repaint of Superman), Silver Surfer (repaint of Iceman and I also cut a board out for him from fiberglass sheeting), Rainbow Sherbert (repaint of Blueberry Muffin), Ginger Snap (repaint of Orange Creamsicle), Ironclad (repaint of Sandman), Pip The Troll (repaint of gumball machine Nightcrawler), Grey Hulk Mr Fixit (repaint of Hulk), Bumblebee (Repaint of Wasp Heroclix), Frosty (Repaint of Strawberry Shortcake), Apple Dumplin’ (repaint of Strawberry Shortcake), Cyborg Superman (Repaint of Superman), Iron Patriot (repaint of Ironman), Dark Fairy (repaint of Tooth Fairy), Black Flash aka Death Racer (repaint of The Flash), Hydro-Man (repaint of Sandman), Glinda the Good Witch (absent from pic but I repainted Sofia the First for this), and Bear-Bear (a repaint of Winnie the Pooh and a mini version of my daughter’s favorite stuffed animal). So there you have it. Its an easy way to show your love without breaking your wallet. The kids get excited and it gives you an accomplished feeling as a parent. What are your thoughts? Have you done something similar for your kids or even yourself?